This summer, The Catholic University of America was selected as the first research university to participate in the South Africa Washington International (SAWI) program, which brings South African college students to Washington, D.C., to help prepare them for leadership positions in their own communities. 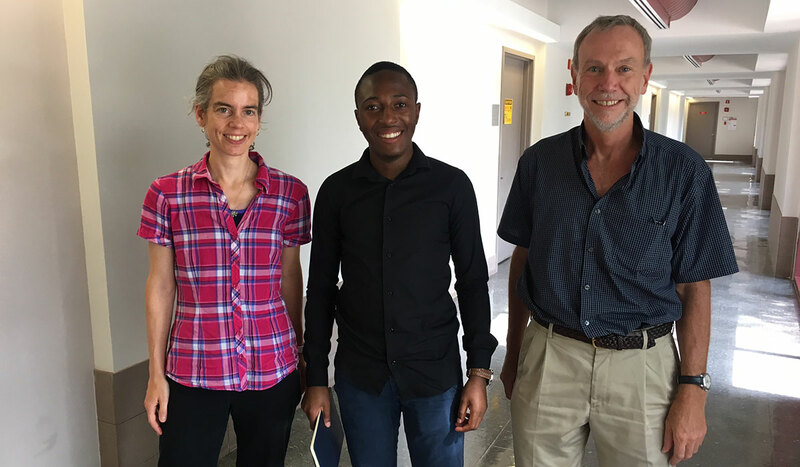 As part of the program, the University hosted Blessed Ngwenya, a senior at the University of Cape Town, as an intern in the Vitreous State Laboratory (VSL) for six weeks in June and July. Ngwenya, who studies physics and applied mathematics, hopes to continue his studies and eventually work as a nuclear physicist. During his time at VSL, he worked closely with Tanja Horn, associate professor of physics, on a project to develop advanced particle detection instrumentation to detect uncharged light particles like photons and neutral pions. 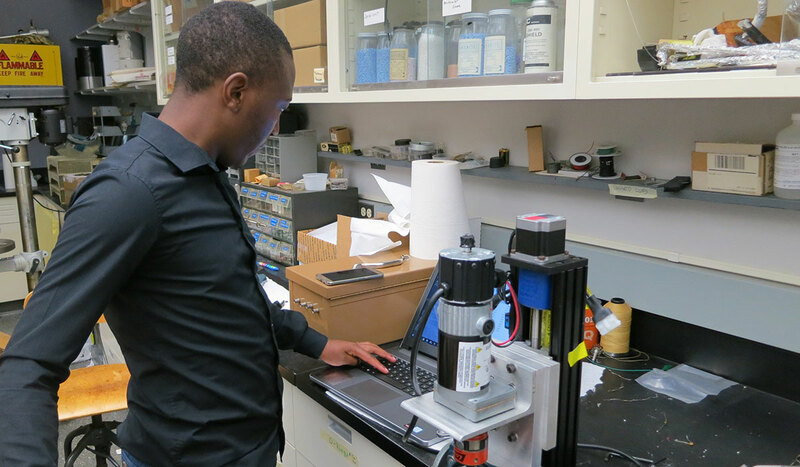 Thanks to VSL’s partnership with the University’s nuclear physics group, Ngwenya worked on a prototype to grow lead tungstate crystals, a key material in particle detection. According to Horn, crystals of this kind play a critical role in nuclear physics research, as well as radiation detection in the medical industry and homeland security. Ngwenya was one of 20 South African students chosen to participate in the SAWI program. While in D.C., the students also spent time visiting various governmental and political offices, and meeting community leaders, including former D.C. mayor Anthony Williams. Ngwenya said he hopes to use the skills he gained during the program and at VSL to give back to his community in South Africa. “VSL's internship program provides students such as Blessed access to state-of-the-art-instrumentation and opportunities for successful research. They have often co-authored publications, been awarded fellowships, and encouraged other students to come to Catholic University,” Horn said. Ngwenya was not the only international student hosted by VSL. According to VSL Director Ian Pegg, the laboratory hosted 25 high school and undergraduate student interns this year, including students from prestigious universities such as Princeton, Stanford, and Carnegie-Mellon, and from as far away as France, Japan, and South Africa. “Since we began the VSL summer internship program in 2009, we’ve hosted a diverse mix of nearly 200 students. I’m always amazed at what these young students are able to accomplish. The program provides a wonderful experience for them and their mentors and exposes them to the many exciting opportunities available at Catholic University and VSL – and we encourage them to spread the word,” Pegg said.